Barcode: who needs ‘m when you have 50 available? ‘This is number 5 in a series’ it says on the cover, although there are already 13 available. With an odd catalogue number – kp 8098. What the hell is going on? 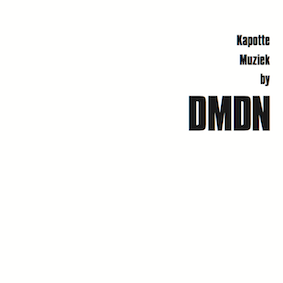 When Korm Plastics started the series ‘Kapotte Muziek by’, it was for friends to remix very specific recordings by Kapotte Muziek and quite early on it was decided that our friend DMDN should do one. Obviously a long term friend for all members of Kapotte Muziek, and co-bandmember of THU20. Enthusiastic he set to work and by the time he was ready to mix down what he had something broke down and everything was ruined. DMDN was no able to fix it, or repeat it and the whole project was shelved. On February 26th 2010 DMDN took part in the 25th anniversary activities at Extrapool as the DJ of the ceremony, using a variety of turntables, cassette decks, CD players all loaded with Kapotte Muziek work from those 25 years (and slipping in some Goem, but we don’t mention that) and out of the blue send us 2 edited highlights – ‘here it finally is’. Now the series started out as a 7” series, then turned CD, but to honor DMDN for just once we go back to 7” – we have 100 pressed up and co-release it with DMDN’s own Antenne Records (although no mention of that on the cover, but he has half the edition, so when in Tilburg, The Netherlands, move over to Noordstraat 82 to visit his excellent store, or visit www.antenne-tilburg.nl). Two excellent dense pieces of electronics colliding and bumping in the hazy night. This might be the final installment in this series, since we have now completed it.